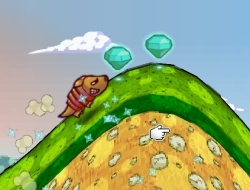 In this fun skill game you will help an armadillo reach his dream. All day for the past few years he has been watching all the birds flying freely in the sky and he got quite a bit envious. He would really like to grow himself a pair of wings and follow them around, but the truth is that he cannot. He found a decent replacement though, but for this to work you have to help him. Seeing as the hills are filled with lots of ramps he figured he could roll off them and stay in the air for quite a while. Make him dive and slide on the downhill parts and then release when he is ready to take off. Collect the cystals to keep him happy and dont slow down too much. Use Down, S or the mouse to play. Dillo Hills 0.00 between 0 and 10 based on 0 votes.